Most soccer clubs will simply give you (or get you to buy) a pair of socks for the upcoming season. However, these products can be pretty poor, wearing down quickly and resulting in painful sores. The best soccer socks on the market will provide greater protection (more padding) and better breathability to reduce blisters. That’s why many players opt to buy their own soccer socks rather than use what their club gives them. In this buyer’s guide we’ll outline some key considerations when buying soccer socks and review some of the best products on the market so you’re ready for the 2018 spring and fall seasons. No time to spare? Use the handy table below to compare our top picks. So what should you look for when buying soccer socks? The color of your soccer sock is actually quite important. Your team may require you to wear a shade that matches the team strip, so be sure to ask your manager. if this is necessary. If you’re a referee for example, you’ll be required to have black socks in most cases. However, if you’re just buying soccer socks for training or for younger children the color isn’t probably much of an issue. If your kid likes red, buy red! Some socks will cover the bare basics – just your shin guards – while others come above your kneecap. What you go for is down to personal preference, so try and see what’s right for you. 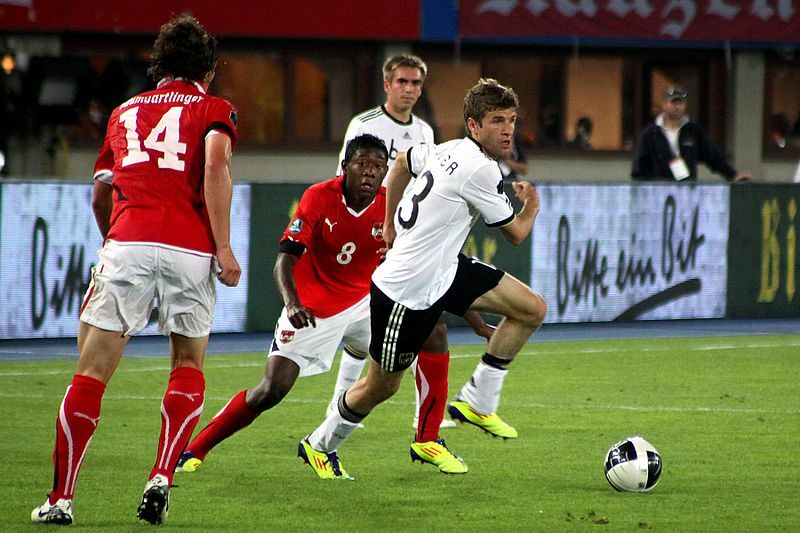 Thomas Müller (pictured on the right, below) is renowned for wearing his socks extra-low. We’re not too sure about that shin guard position though! Crew cut socks are the short varieties that finish on the middle of the shin. Traditional/over the calf socks should end just below the knee. Over-knee socks go up to the start of your thigh. Not many socks are sold like this, however some regular/traditional socks are supposed to be folded down. You can use these instead without folding them to achieve an over-the-knee effect. However they might not stay up unless you tape them. 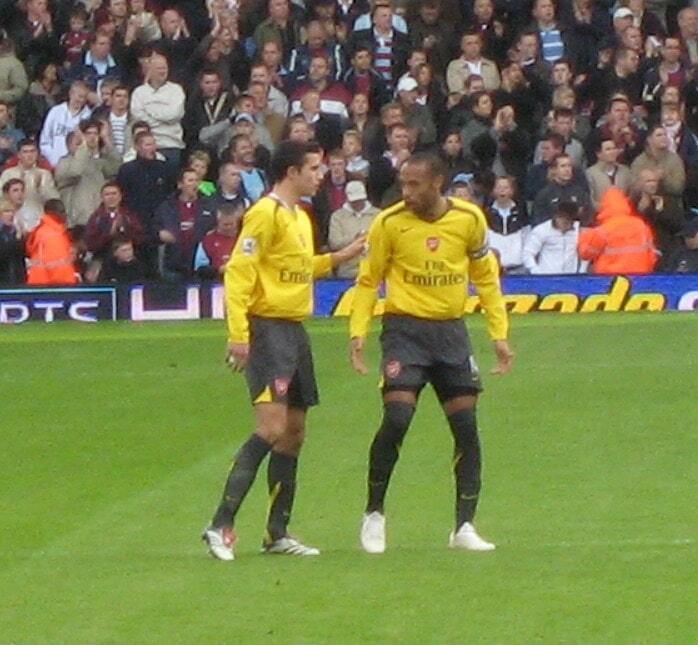 Robin van Persie (left) with traditional length (over the calf) soccer socks and Thierry Henry with over-the-knee soccer socks. Photo by Wonker on Flickr licensed under CC BY 2.0. If there’s a specific reason you’re buying soccer socks (like to stop getting blisters) you’ll want to ensure the product meets your specific requirements. Some of the following reasons for buying are listed below – consider how important each one is to you. Warmth. If playing in a very cold environment it can be worth getting socks with extra thick padding for warmth, especially if playing in goal. However, the downside to having thick socks is you lose some of your feel for the ball, which can be an issue for wingers and CAMs who dribble the ball frequently. Moreover, socks made with natural materials such as cotton tend to be warmer than synthetic alternatives such as polyester. Breathability. On the other hand, if you play in hot, humid conditions it’s a better idea to get thinner or more breathable synthetic socks to reduce sweating. This can in turn help to reduce the occurrence of blisters. Socks advertised as having breathable fabric (such as Adidas’s ClimaLite options) are designed to wick sweat away from the feet/legs. Durability. More expensive socks from top brands will be more durable. If you wear holes in your socks easily it’s worth buying better ones which will last longer. Wearing socks with holes in them is a recipe for blisters and discomfort while playing. Knee protection. Some players love to dive or slide (goalkeepers and defenders especially) and so they buy socks that will cover their knees to prevent grazes. Blister prevention. Some socks are designed to stop you getting blisters by reducing sweating and fitting snugly to the foot. In general, you’ll want to ensure your socks fit tightly (whether buying blister-proof socks or not) to reduce friction and ensure your feet are comfortable while playing. Natural (cotton, wool): warmer, possibly more comfortable. Synthetic (polyester, spandex, acrylic): more breathable and more durable. When looking at socks try to find out what proportion of each type of material is used to assess its qualities in relation to your specific needs. Soccer socks come in sizes ranging from extra small up to extra large. Each brand has a slightly different definition of each size, and each size will fit a certain range of shoe size. For example, an Adidas medium fits a men’s 5-8.5, women’s 5-9.5, and youth shoe sizes 4-6. Check the guidelines issued by the manufacturer to find your size. Now let’s look at some of the best soccer sock offerings on the market right now. Most of Adidas’s modern socks such as the Rivalry over the calf (OTC) model are made of a relatively thin synthetic blend – this sock is made of 93% polyester, 4% spandex and 3% nylon. This reduces sweating in-game, which can help to prevent blistering. Plus, these synthetic materials are quite durable, this sock in particular can last for an entire season or more quite easily. Another benefit of this thin sock is the exceptional control it offers, making it a great option for wingers and midfielders. The downside to this is that it isn’t incredibly warm, so it’s not suited to goalkeepers playing in frosty conditions. Despite the actual sock being thin, the sole is reasonably padded, which you definitely notice when playing especially when the sock is new. Overall this sock is a great all-rounder, offering great comfort while maintaining that “barefoot” feel depending on your cleats. It’s also priced fairly reasonably and comes in a range of different colors to match your team strip. Offers great control & feel for the ball. None to mention – great socks for the price. Like Adidas, Nike also makes a nice thin synthetic sock designed to wick sweat using their “Dri-Fit” fabric. However, this sock is designed for a better, more snug fit. The calf portion is quite tight which helps to keep your shinguards in place, and Nike has customized each sock specifically for the left and right foot. This results in a better fit, particularly around the toe area. Plus, you can take your pick from a range of different lengths – crew, OTC and OTK are all available. However, if you don’t want a tight sock the Nike Classic probably isn’t for you. For some players this “compression” fit can be quite uncomfortable, even though these socks can wick sweat better than other looser options. The Classic also uses a medium-density synthetic material, achieving a good balance between warmth and feel for the ball. Whether this will suit you is also down to personal preference. Despite coming in a heap of different colorways, Nike’s product can be relatively expensive depending on your size. Tight fit – helps to reduce blistering. Available in tons of different colors & cuts. Bit pricey in certain sizes. If you’re looking for a snug sock and the Nike Classic doesn’t appeal to you, Adidas’s Team Speed might be your best bet. Like the aforementioned product these socks are designed to be quite tight and are customized for each foot, meaning they fit really nicely. At the same time they’re pretty stretchy, meaning you’ll have no issues getting them on. The difference between the Adidas Team Speed and the Nike Classic is the former is a bit thinner and is quite long. Don’t let the picture fool you – you’ll get over-the-knee socks unless you order a size down. This isn’t an issue really though – if you just want an over-the-calf option you can fold these socks down over your shinguards. As with the two pairs we’ve reviewed so far, this sock comes in a heap of different colors. It’s also quite reasonably priced compared to most of Nike’s options. Solid sole & toe cushioning. Can wear down quickly compared to more expensive socks. The main reason you get blisters when playing soccer is the friction that’s generated between your socks and your cleats as you run around the pitch. This consistent rubbing works away at your feet as the game progresses, resulting in painful sores and blisters. As a result, Adidas has produced a sock with “Traxion” areas around the heel and foot to increase grip inside your cleat. For players like myself who get blisters pretty much every game, this grippy material is awesome. It’s definitely worth a shot if you’re prone to developing sore spots when playing. Apart from the Traxion areas this sock is pretty standard. It’s made of a relatively thin synthetic composite with ClimaLite technology which offers decent breathability. Each sock is custom fitted to your left and right foot respectively, meaning they’re pretty comfortable and fit nicely. They also come up to just below the knee, which is what most players prefer. Traxion material does a good job preventing blisters. Average durability on the Traxion pads but the price makes up for this. Now we’ll have a look at some cheaper soccer socks. If you’re not prone to blisters, you wear your socks out quickly (no matter how thick they are) or you’re buying for a younger child, it can be worth opting for a less expensive option. The Soxnet acrylic socks come in a pack of 3 and are priced very nicely. They’re also pretty thick and have a cushioned sole, so the durability isn’t as bad as you might think for the price. However, they’re not incredibly breathable – if you normally suffer from blisters these aren’t the socks for you. All the regular colors are covered so you’ll have no problem pleasing your team manager with these socks. Because Soxnet is a relatively small brand, they promise to help you if you have issues with the fit or the durability of these socks. Apart from the price, this is probably the biggest advantage of these socks compared to a Nike or Adidas option. Massive range of colors & sizes. The Adidas Metro IV is another budget option, but it’s not quite as cheap as the Soxnet socks we reviewed above. These socks are a bit thinner though, which helps to keep your feet cool and reduce sweating. However, the downside to having thin socks is that they can wear out quickly. These socks don’t come in as many colors as our #5 pick, although you can get them with stripes. So if you’re looking for a basic, breathable sock from a trusted brand, the Adidas Metro IV is a great buy. We must say though that it’s probably worth looking at Adidas’s premium options to ensure the longevity of your new socks, as they’re not that much more expensive. Snug, tight fit (most players prefer this). Adidas also makes a superb all-round over-the-calf sock that’s quite thick and has a cushioned sole. However, this isn’t a sock designed specifically for soccer, rather it’s made for athletes who play a wide range of sports. This isn’t really an issue, in fact if you play other sports such as baseball in the summer season you can use these socks for both which is great. Because they’re designed for comfort in a range of sports, these socks don’t offer the greatest feel for the ball when playing soccer, which can be an issue for some players. As with other synthetic options from Adidas, the “ClimaLite” composite material is very breathable and comfy when playing as well as when you’re walking around the pitch pregame. Because this is a tight-fitting sock, it doesn’t fall down easily, meaning shinguard tape won’t be necessary for most players. Suitable for a range of sports. Not designed specifically for soccer players. If you’re a goalkeeper, you live up north, and the rest of your team is decent, chances are you might get a bit chilly between the sticks from time to time. Fortunately, Adidas make a thicker sock – the Copa Zone Cushion – to keep you nice and toasty. Although these socks aren’t made with naturally warm materials such as wool, they have added cushioning for protection, which acts as a barrier from the chill. However, on the rare occasion that you play the only other good team in the competition (or it happens to be warm), the synthetic “ClimaLite” fabric will help to keep you cool by wicking sweat away from your body. What’s more, these socks are very reasonably priced and come in a ton of different colors. They’re also quite durable which is essential for goalkeepers and outfield players alike – I think this is in part due to the thicker material used. The only issue with these socks is the build quality. Some have reported issues with the stitching of Adidas’s signature three stripes at the top of the sock. In saying this, having a few loose threads isn’t a big deal really for most players as they don’t tend to unravel during play. Instead of just making the entire foot area padded, Nike has designed this sock with a thicker toe and heel area for durability and to prevent rubbing. As a result, this sock has a great feel for the ball and can last for ages, depending on your position and how often you play. In my experience, it was always the toe area that split first, so it’s good to see Nike work to specifically address this issue. Apart from the toe/heel padding, this is an awesome synthetic sock. Nike’s “Dri-FIT” technology combined with the thin calf material does a good job keeping you cool. If you have the occasional blister with your club’s generic socks, the Nike Academy is a great option. However, if you’re prone to severe sores, it’s a better idea to go with a sock specifically designed to reduce the occurrence of blisters (and also use other blister prevention strategies). Does a good job preventing blisters. None available – great all-round socks. For children, comfort is a top priority. Manufacturers often design youth socks to be super soft and stretchy, which makes them easy to put on and take off. Getting colors that match your team strip will probably also be less of an issue than it would be for teen/adult players, depending on your association’s rules. 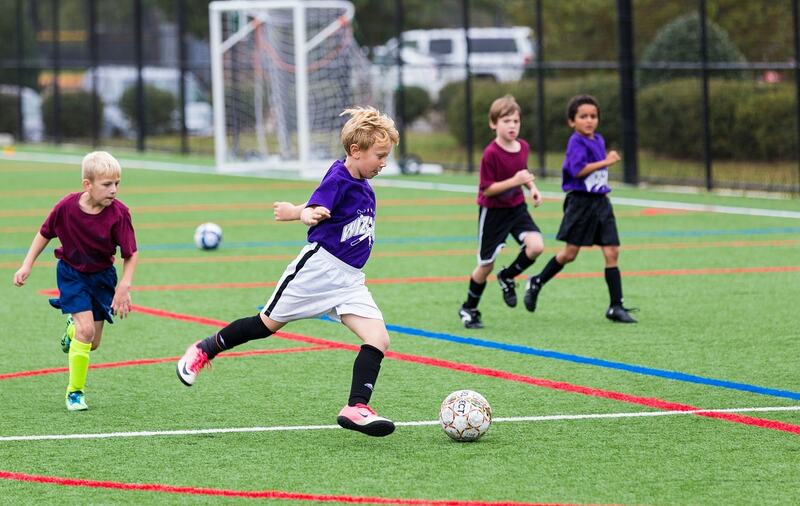 Remember, depending on your child’s shoe size they should be able to use some of the varieties of adult soccer socks we’ve discussed. 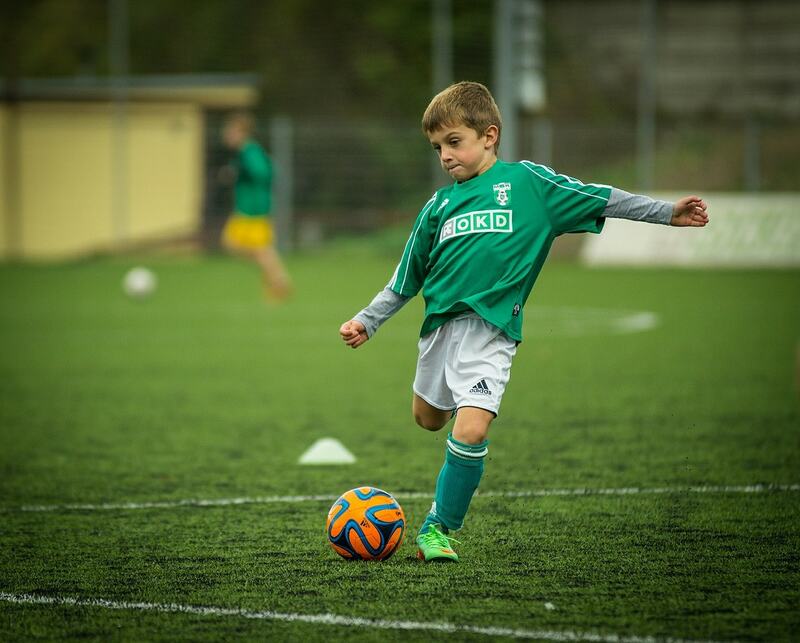 If your kids find your club’s generic socks pretty uncomfortable, LITAO’s youth option is likely your best bet. They’re designed to be super stretchy, meaning most children can put them on or take them off without help. The cotton/synthetic composite material does a great job of wicking sweat while also ensuring the socks are super soft and comfortable when playing. I’d say overall these are probably the best soccer socks for younger kids on the market right now. Why’s this? The available colors are super bright – kids love this. Quite durable for the price. Easy to get on & off. For older kids, having socks that are comfy and easy to put on isn’t such a big deal. This means you can get tighter socks that are more likely to keep your shinguards up (if you have type without straps). For this reason, we recommend the Youth Field II sock for ages 10 through to 14. Because the sock is quite tight the ClimaLite synthetic fabric is able to hug the skin, wicking sweat and doing a great job of keeping you cool. It’s also reasonably durable, which is especially good for an over-the-knee sock – those slides can wear the top of the sock out pretty quickly if the fabric isn’t tough. You can always fold them down though if your son or daughter prefers an over-the-calf sock. Finally, we also love these socks due to their price and their nice soft texture. Not as easy as our #9 pick to put on & take off. You’ve reached the end of our buyer’s guide! Still unsure which soccer socks to get? Leave a comment and we’ll get right back to you!